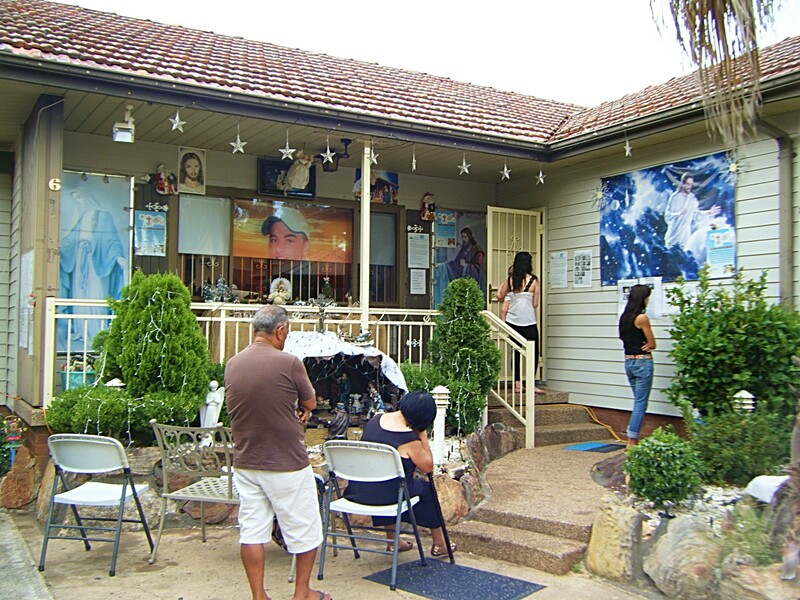 I went to see the Tannous family house where they say their son should be Australia’s second saint, after the recent go ahead for Mary MacKillop. You can read the background here and here. The home has a welcoming atmosphere and inside, where the oil on the walls is immediately apparent, there is a peaceful, calm atmosphere. 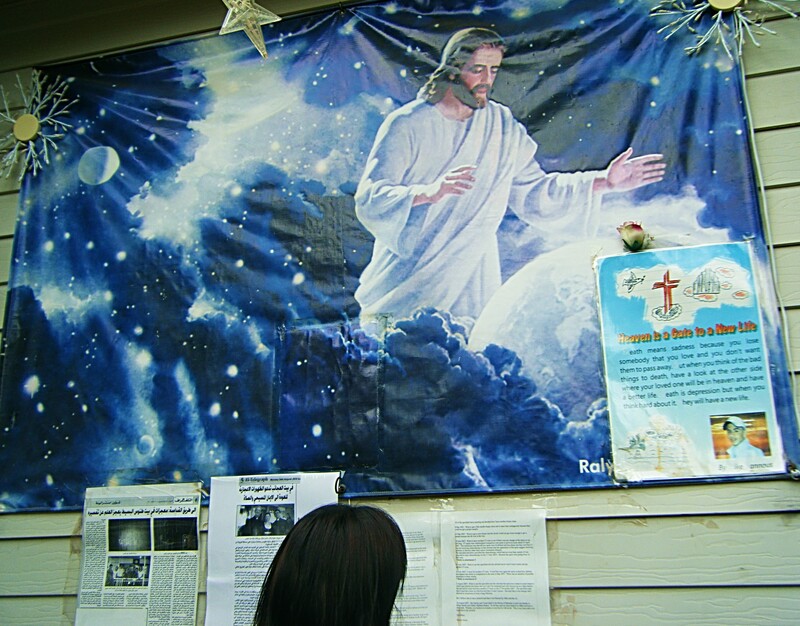 Outside there’s a pleasant grotto where the rosary is said every Fri night at 8pm. 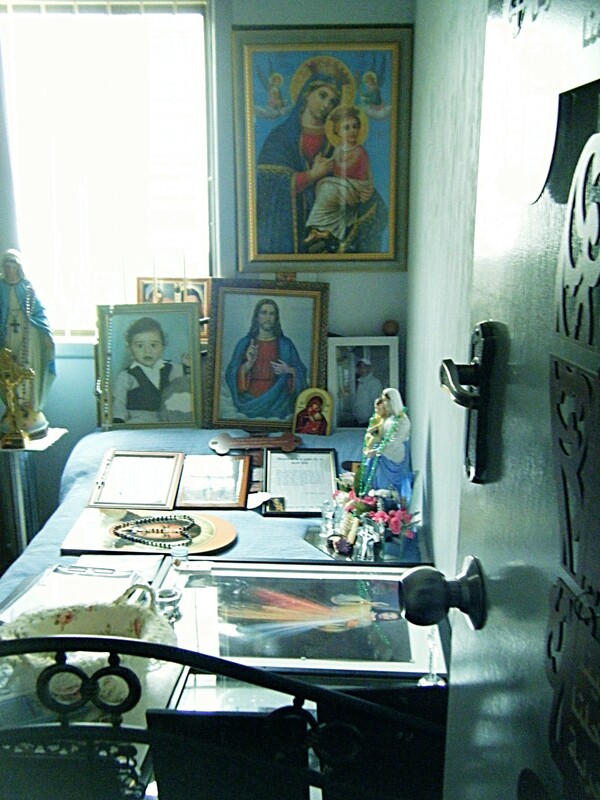 Fr Michael Melhen did a tour for about 10 of us around the corridor and Mike’s bedroom. He sincerely believes that Mike is a messenger from God, who is showing us – via the rose-scented oil and other signs — the link between life and death. There is more than just rose-scented oil oozing from the walls. It’s a full-on spiritual central – Fr Michael pointed out – using a torch in the corridor – that Mike has done oil drawings on the walls of a chalice (“emphasising the importance of going to Mass”), a ship of salvation, candles, and other religious symbols. And it’s not just Mike — the Virgin Mary had been busy too, appearing four times in the corridor where we were standing in the past few months. And a statue of Mary in Mike’s bedroom regularly weeps tears of oil. Fr M said this means Muslims can also appreciate the messages from Mike. Then Fr M gave us a pamphlet outlining Mike’s story and a sample of the oil and most of us left to view the religious icons and written information outside while a family of five wanted to stay in Mike’s bedroom and pray for a special intention with Fr M. There are no requests for donations. A Muslim bloke asked me whether I believed in it. He wasn’t convinced but had come along after reading about it. “I believe it’s good,” I said. I’d spent 29 years of my life trying to make sense of a chronic pain condition which was cured two years ago. So I have a huge appreciation for people’s attempts to make sense of disabling pain. Despite my searching outside via many interests and groups, and also trying to change myself within, I was never able to successfully find any meaning in it or make any sense of it. I half-learnt some things: spending on healthcare is important cause all virtues/productivity go out the window when you’re in terrible pain; compassion for those dealt a bad hand of cards; not to push everyone to be a “winner” cause some people don’t have the energy; that some major disabilities are “invisible”; that many sicknesses aren’t caused by your own thinking. I didn’t feel I’d come out of it with very much; it mostly seemed pointless. I also feel scared that something will strike me again, which is pretty inevitable with ageing. My thoughts on the miraculous happenings: if it were just walls oozing oil, it would be easier to accept, because it could be a natural reason. 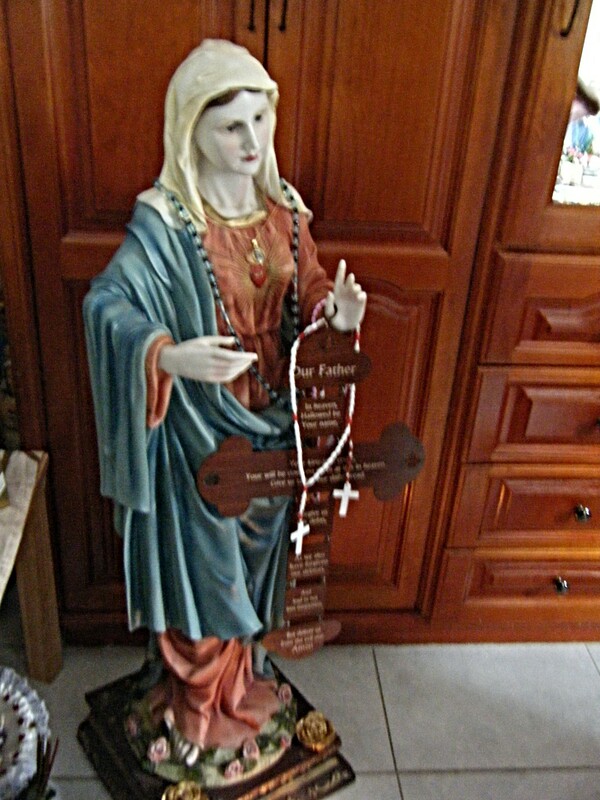 But the scent, the drawings, crying statue and apparitions of the Virgin Mary in the corridor take it to another level. The only thing missing is someone with stigmata. I’m not surprised that Pope Benedict XVI didn’t include it on his itinerary when he visited last year, as it seems like too much is going on at once. But who knows? There are probably many dimensions we don’t know anything about. Maybe in these days of reality shows etc, God has decided more regular exposure is needed. Fr Michael also mentions that a baby photo of Mike pointing one finger up “to heaven” is a sign, as there’s a famous picture of Jesus pointing to heaven. I didn’t think that link was doing the cause any favours, though orthodox/traditional believers might like it. I didn’t get to meet the parents, Lina and George, but they seem lovely in the YouTube clips. The good thing is that Mike’s death has helped them open their home and reach out to others and they have weekly prayers in the garden. I’m sure anyone would be welcome, even if you hadn’t experienced a miracle there. It’s a pleasant, friendly place. 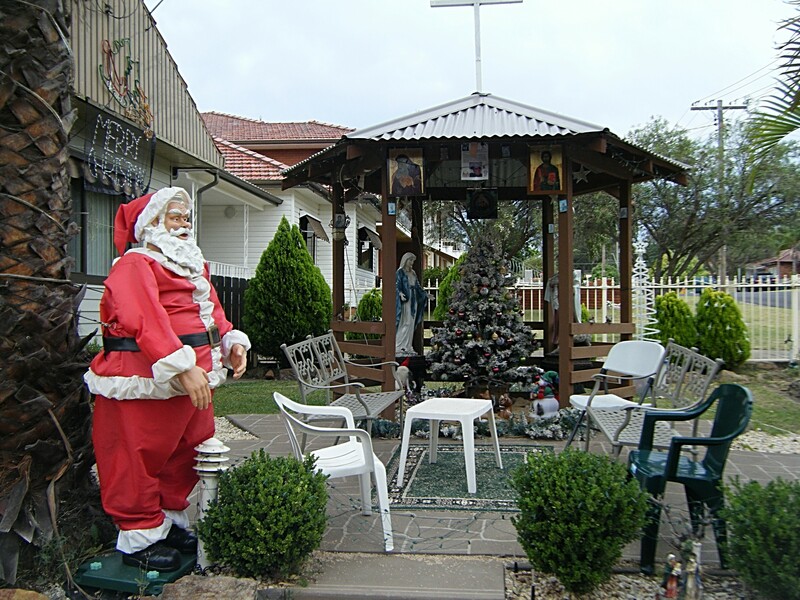 I was wondering how property prices for neighbours are affected when living near a saint? Parking might be a problem. It isn’t the typical way saints are expected to depart. He used to be a regular church-goer. 6 Bowden Street, Guildford, NSW. Visiting hours are Mon, Tues, Thurs, Fri 11-2, 4-6. Sat 2-3pm. Closed Wed and Sun.